Nine different models of the Eee PC are to be found on the homepage of Asus Germany at the moment, and those do not even include all variations offered by retailers. Since those older models which are on sale, as well as the Asus N10 (not an Eee PC officially), are not listed, one has the great agony of choice at Asus alone. Eyes should be kept open due to the partly enormous differences concerning display, battery life, and configuration. The pros and cons should also be balanced to see which model is needed. The 1000HE is supposed to be especially stylish and enduring, and it additionally tries to convince possible buyers through user-friendly applications. 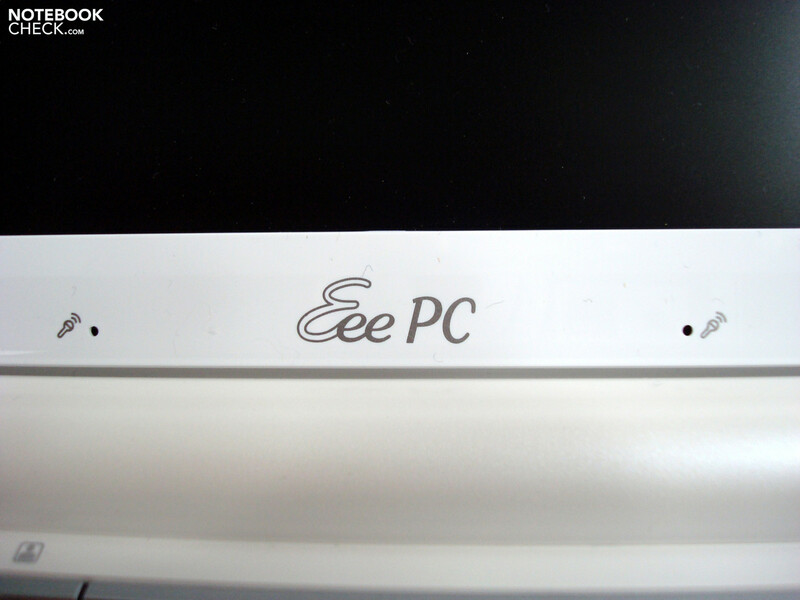 The Eee PC 1000HE tested by us has a case which is of identical construction to the well-known Eee PC 901, 904, and 1000 series and is in principle available in 6 different colors. At the moment, one has to go without the alternatives of blue, gold, pink, and silver since only the black and white variant are offered here in this country. They all share a high-gloss finished surface, which makes a very classy impression when untouched, but does exhibit obvious traces of usage after some time in use (depending on the outside color). Our white test model showed very good conduct in this context, since its surface conceals finger prints and dust particles very well, it only reveals them on a close look. The otherwise monochrome look is broken up by the unobtrusive usage of some chrome-colored elements, such as the cover of the display hinges, the button bar above the keyboard, and the frame of the touch pad - it even gets a classy look. The display's frame appears to be very wide and even somewhat clumsy, but it does in turn constitute a protective cover of great torsional stiffness. This can by the way be applied to the whole case, which has to be called very robust. One can only elicit a light creaking when applying stronger pressure to the area around the palm rest. 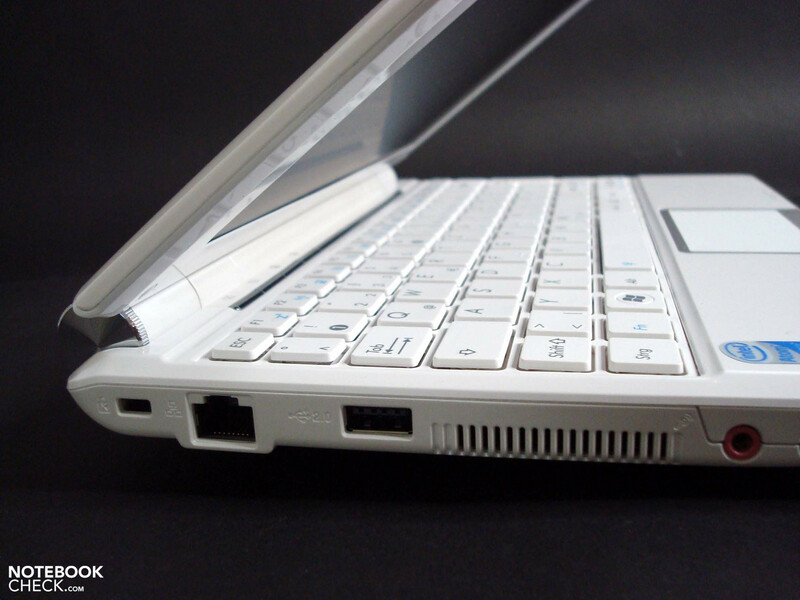 The keyboard can also be dented a bit around the edges, but this does not have any negative influence on general usage. 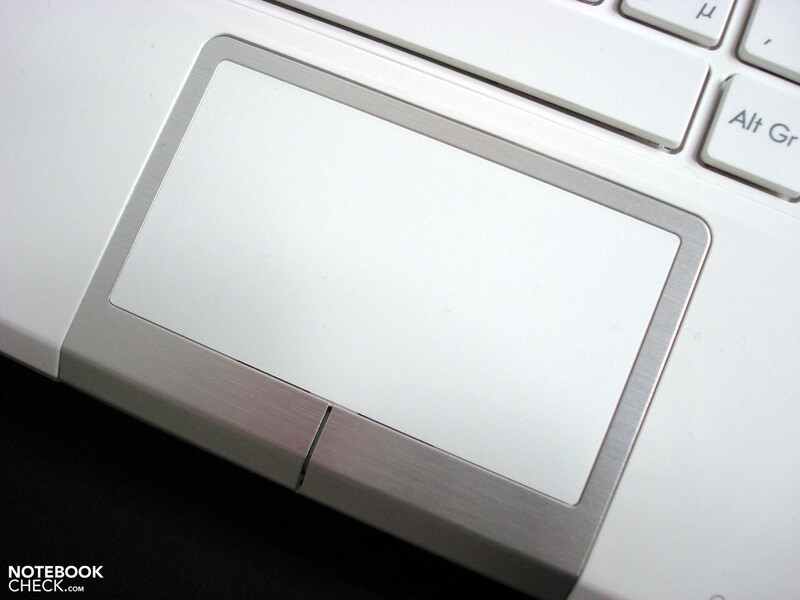 The display hinge performs its work in an exemplary way, but does, as a side effect, have the disadvantage of not allowing single-handed operation. With case dimensions of 266mm (w) x 191.2mm (d) x 28.8-38mm (h), the 1000HE does not belong to the slimmest representatives of its kind, but it does skilfully hide the 6-cell battery in the area of the display hinge and therefore does not have an extension off-standing downward, as visible on some competitors. It thus leaves a compact optical impression, but can not quite keep that promise with a test weight of 1460g on the scale. A great amount of that is of course due to the already mentioned 62 Wh battery, which is a main argument for buying an Asus Eee PC 1000HE. It alone weighs 310g, fits in the case solidly, and can be locked additionally. Without the battery, there are no problems of standing, meaning the battery can be removed without problems during stationary usage. 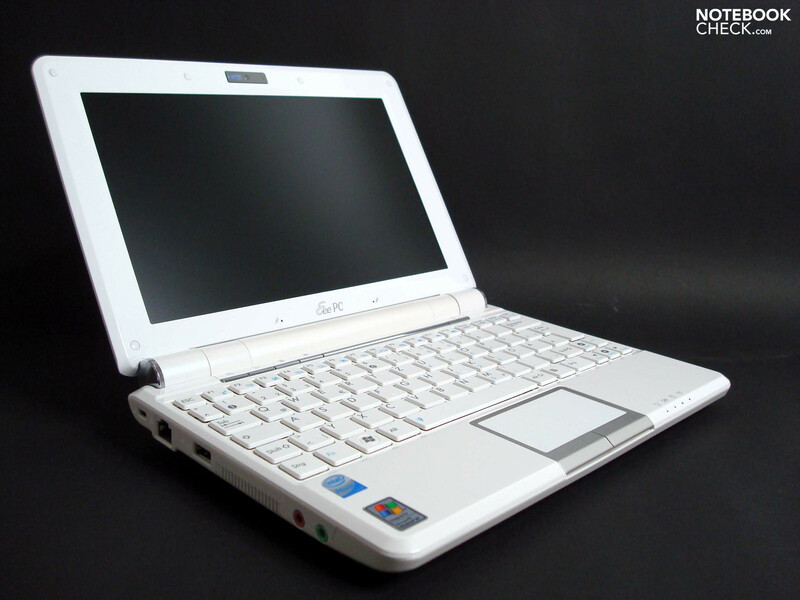 Compared to the announced Asus Eee PC 1008HA, the 1000HE's design all in all definitely seems antiquated, and almost pudgy. It does, as will be shown later, convince through the intrinsic values of its inner components. 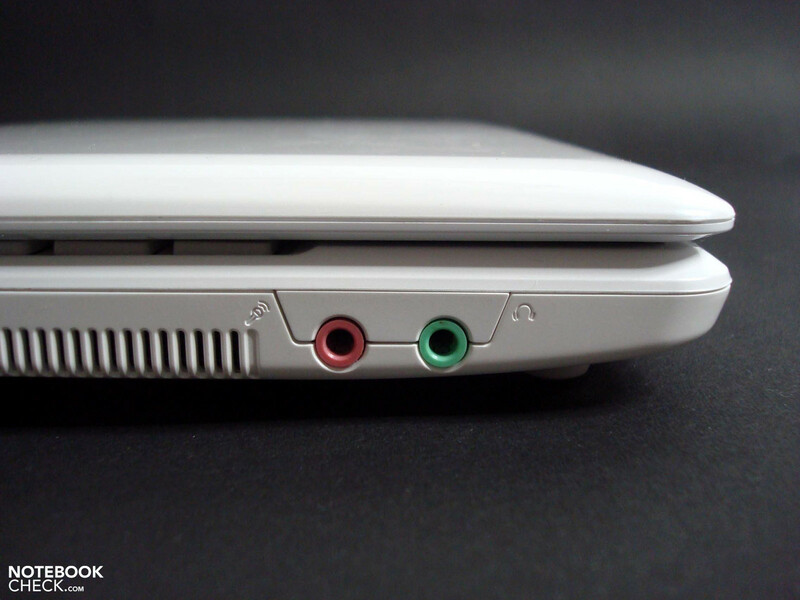 The ports offered come off modestly, as is typical of netbooks. 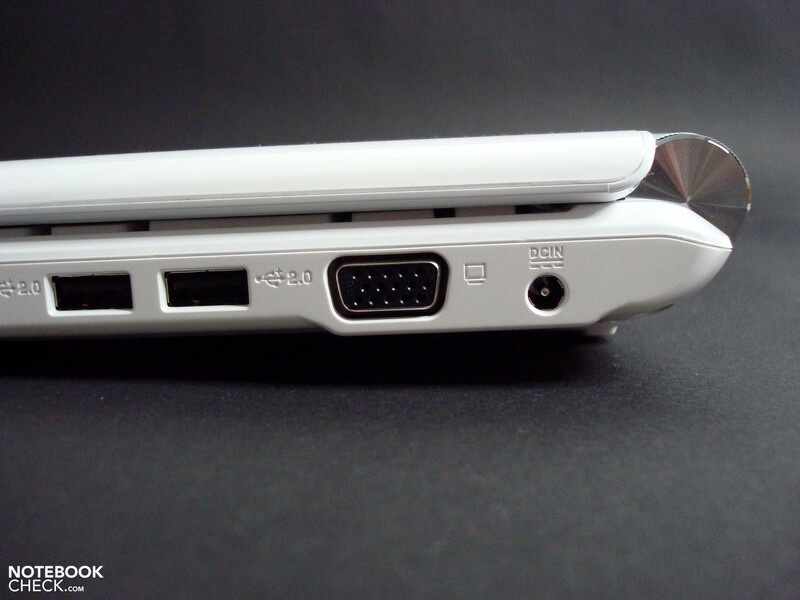 The competion's level is reached with three USB-ports, a VGA output, LAN, audio, and a card reader (SD/MMC). 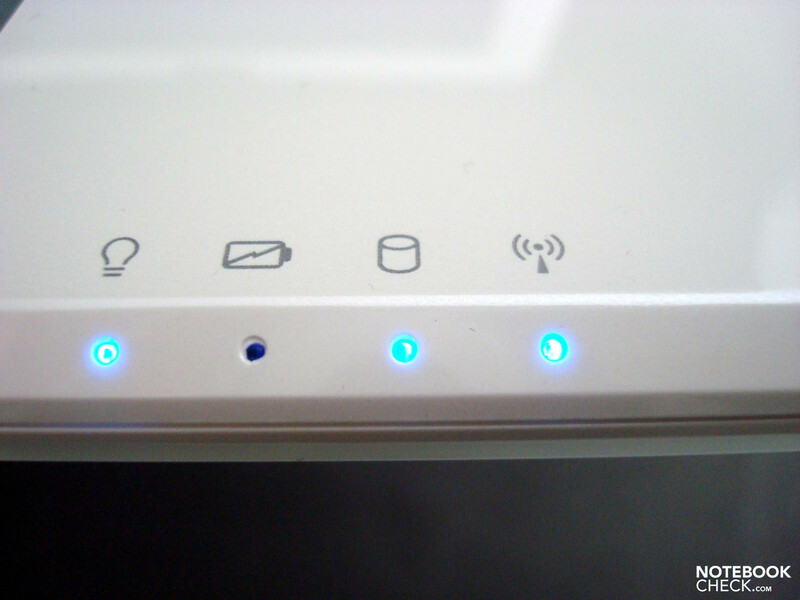 In terms of wireless connections, the Asus offers a level of good average with Draft-n WLAN and Bluetooth 2.1+EDR, and thus fitting possibilities of connections for most scenarios. 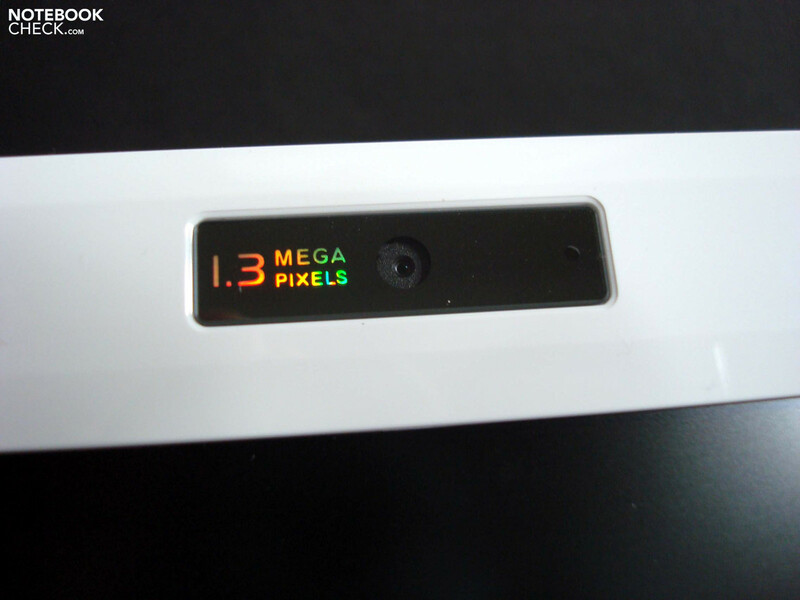 In connection with the 1.3 MP webcam located in the top of the display's frame, and the microphone openings located in the lower area, one is prepared for Skype and Co. adhering to standards. The customer only has to go without a UMTS-module, which would complete the wireless equipment. This can be upgraded at low cost via an USB stick when needed, as usual. 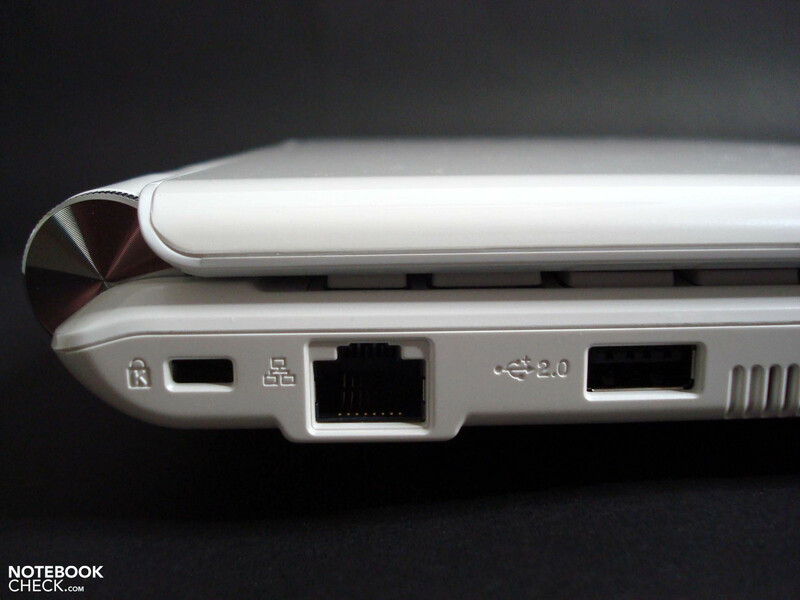 We are completely happy with the distribution of the ports, apart from the audio ports located on the side, which we personally would rather have seen on the front. There are no limitations visible, all ports are located on both sides, as far back as possible and with sufficient space between them. 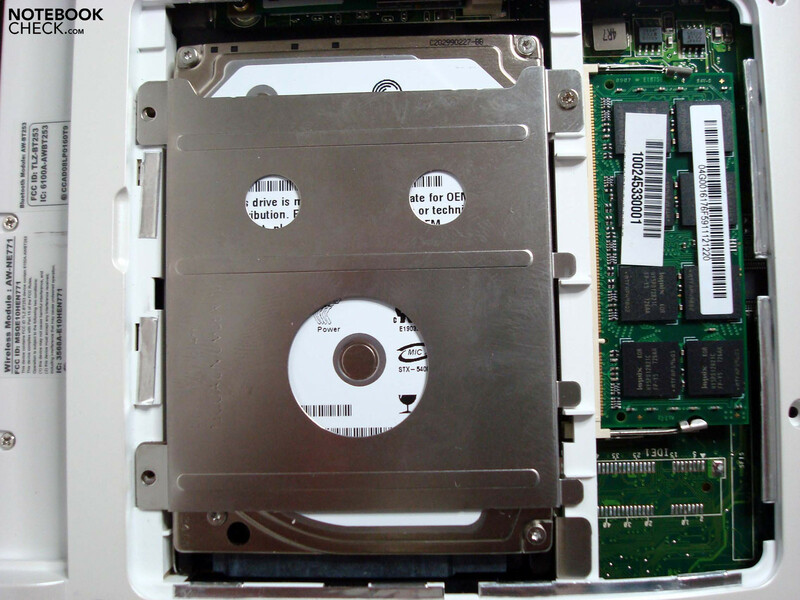 Those components reachable via the underbody, such as system memory and hard disk, are located under a shared hatch (fixed with two screws), which can be removed quickly. 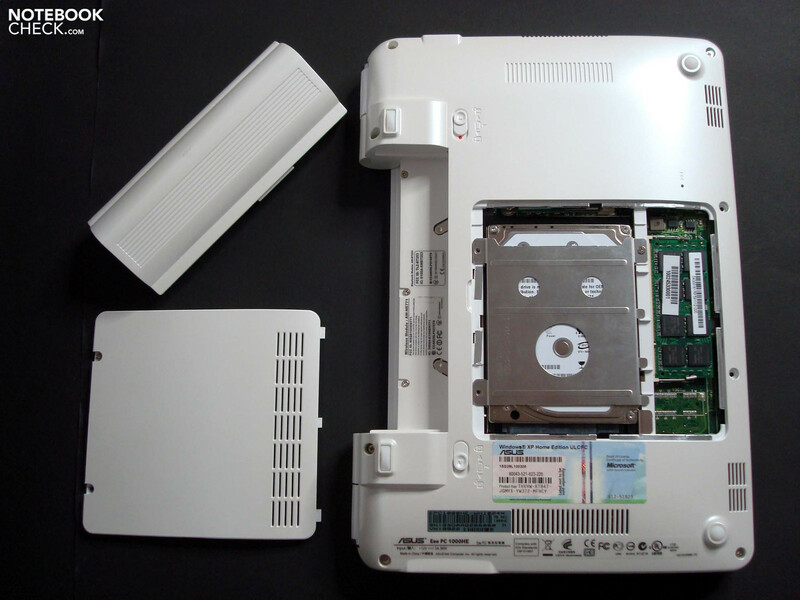 Since the netbook has only one slot for system memory, one has to replace the 1 GB module present through a 2 GB module. 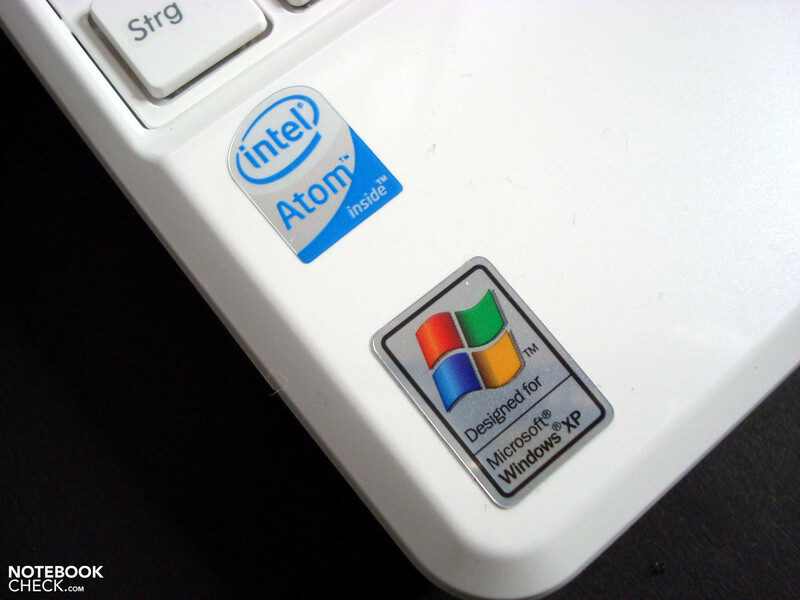 Only very few would want to upgrade though, the 1 GB system memory and the hard disk with a capacity of 160 GB are sufficient for the installed Windows XP Home operating system and most tasks. Asus ships a simple neoprene sleeve, a useful manual, and a cleaning cloth as accessories, the warranty is valid for a duration of 24 months. 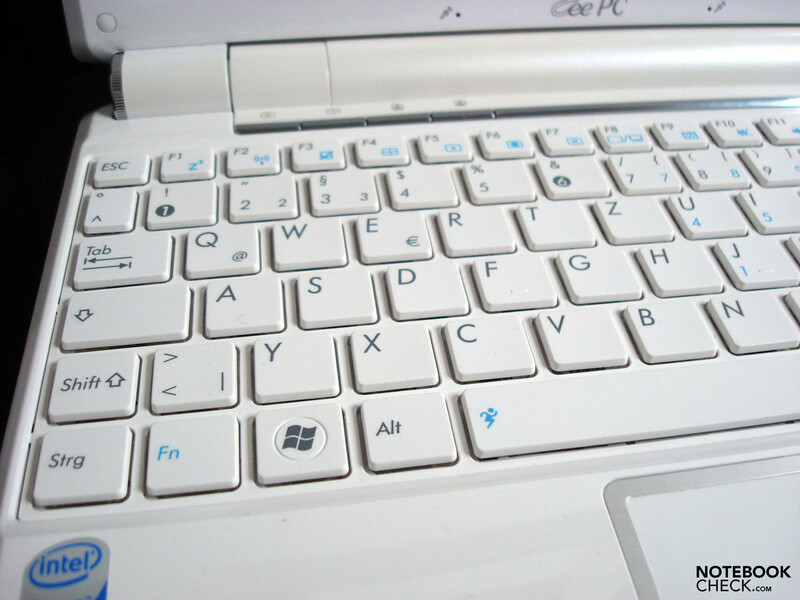 The keyboard uses up almost all the space available horizontally and features nifty isolated keys (Chiclet), which are also convincing in terms of quality. 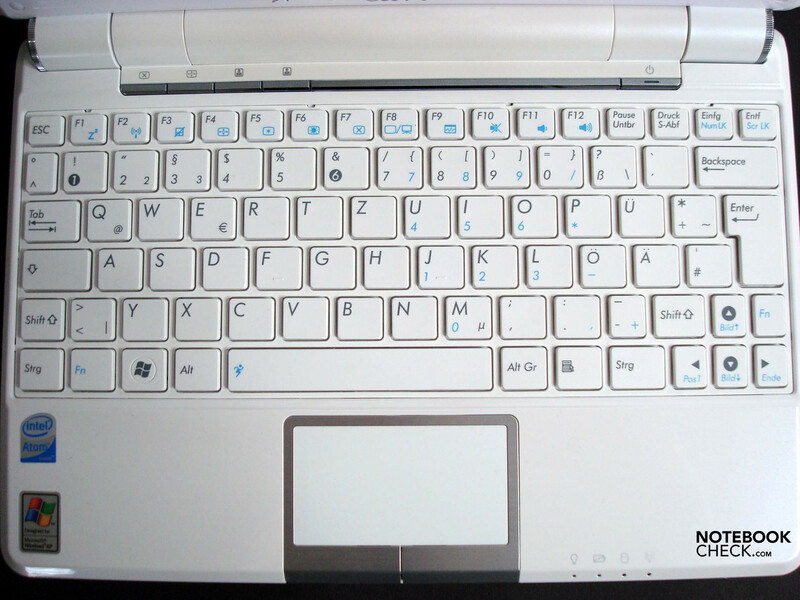 The clear keyboad layout features keys with a size of 17.5mm and thus reaches 92% of the size of a standard keyboard. The medium hub, the pleasant sound, and the stroke make it possible to attribute the aptitude for extensive typing to the keyboard based on its basic properties. 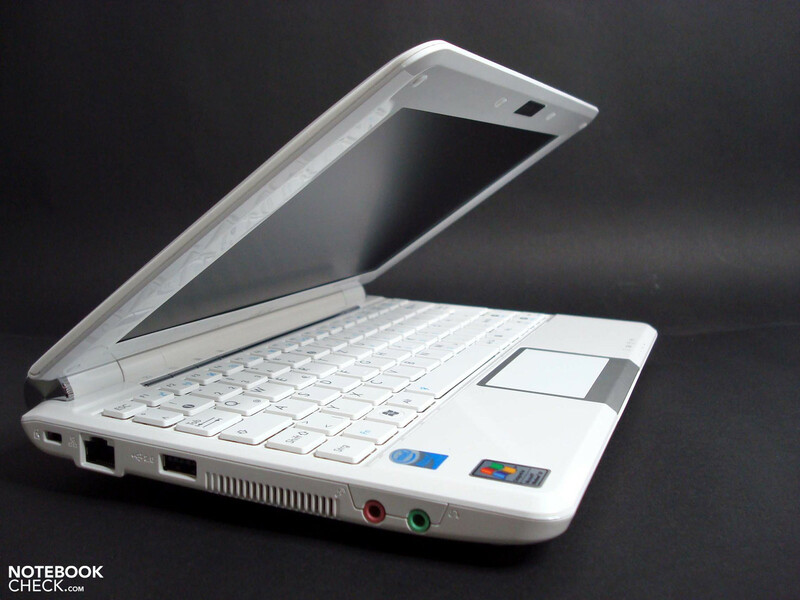 The smaller size (typical of netbooks) affects this in a limiting way, it needs a longer time of getting used to and might not convince every user right away. 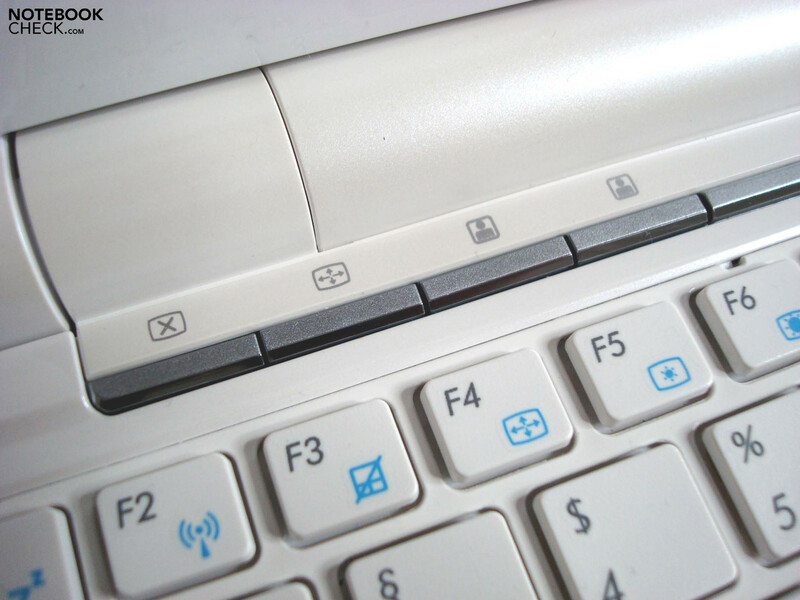 As usual, the Eee PC features several special functions in the area of the F-keys, available via an Fn-combination, e.g. controlling the display's brightness, or the volume. The numeric block, integrated through double occupancy, is a well-meant gimmick, but it will not be used as much in practice due to the shifted layout. 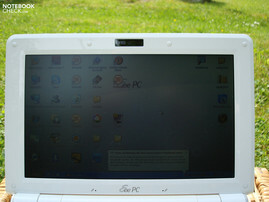 The quick start bar with four buttons, located above the keyboard, offers two functions (background lighting / resolution) pre-defined by the manufacturer, and leaves two freely definable for the user. These are per default pre-configured with the Asus-energy-saver-profiles and Skype, but can be, as mentioned, changed as one likes. The touch pad could not really convince on our test model, it either did not recognize input at all, very lagged, or even severalfold. This behavior could barely be improved through changing the settings and has to be categorized as strongly needing getting used to. The multi-touch function did also not work corresponding to the presetup, it has to be called pretty sluggish. This is unusual, as the Eee 901 and 1000H made a much better impression. The touch pad's keys, on the other hand, do not let any first sign of critique emerge and fulfill their purpose through good responsiveness and with pleasant sound. 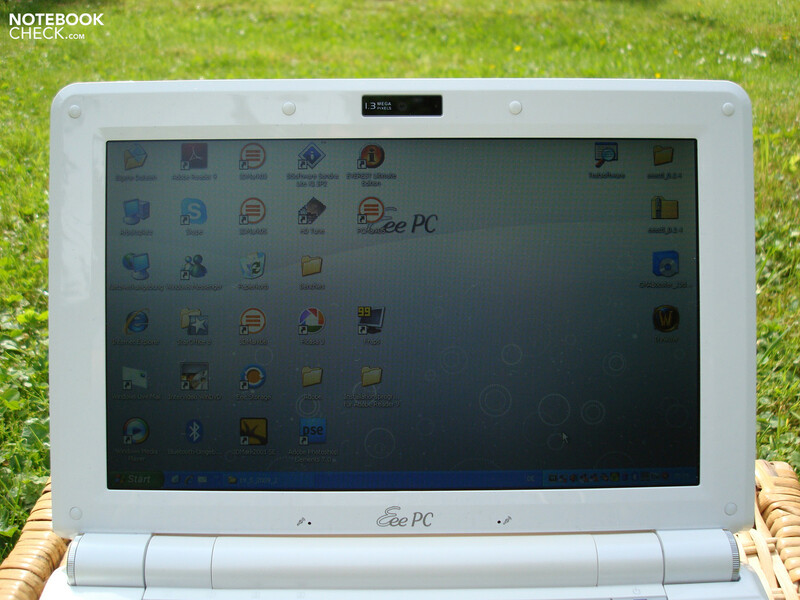 The Eee PC 1000HE still has a matt display surface in the 16:10 format and thus spares its users unnecessary reflections, after more and more netbooks with trendy glare-type displays are released. The excellent contrast value of 832:1 and the comparatively saturated colors, which are not self-evident in notebook displays, are also pleasing. Even so, the screen is suitable for mobile usage only to a limited extent, due to its factory-provided maximum brightness of averagely 155.9 cd/m². Although this is enough for not having to think much about disadvantageous lighting conditions indoors, the background lighting is simply too weak for working open-air. It only makes a hindered reading of the screen's contents possible, if at all, and therefore is not pleasing any more after a short time. 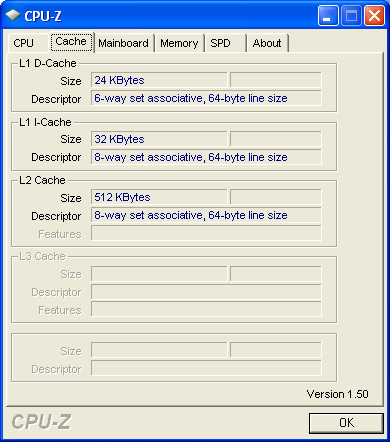 During mobile usage, the display's maximum brightness in addition is limited to 149.2 cd/m² per default, this setting cannot be switched off in the Bios. However, the option of raising the native resolution from 1024x600 to 1024x768 pixels is pleasing. It can either be used through a custom, yet slightly distorted image, or through scrolling the desktop on the internal display. The illumination has to be described as not optimal, but still good, with a distribution of brightness of 79%. This effect is only recognizable on monochrome contents on the display and does not lead to any objections during regular usage. The display's stability of the viewing angle is good and visibly above average. There are indeed some image changes noticeable, in the vertical area rather than in the horizontal one. These do come up later than they do on some competitors. Watching movies with several persons would thus not be a problem and will only be limited by the small display size. The only disadvantage is, as mentioned, the display brightness, which is not suited for outdoor usage. 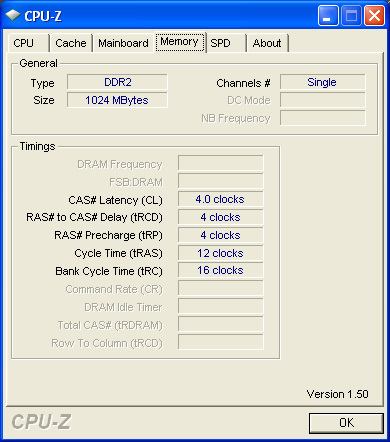 At ones own risk (and possibly with a loss of warranty), a remedy for this can be found in the overclocking tool eeectl - a maximum display brightness of up to 318 cd/m² can be reached at a moderate additional consumption of 1.3 watt. Through this, the limited display brightness during battery operation can also be circumvented. All of this of course is done at the expense of the display controller and can lead to an according affection of its lifespan, since it is far beyond the planned specifications. 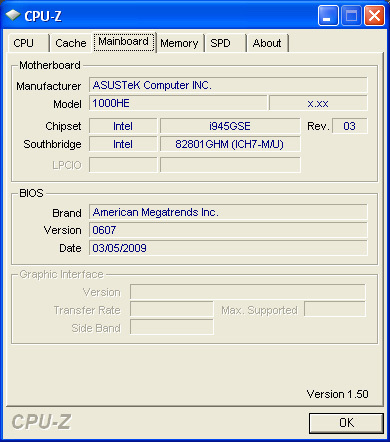 Asus faithfully fulfills all guidelines from Intel and Microsoft in order to receive price-reduced processors, as well as being able to offer Windows XP Home Edition as operating system. With Intel's Atom N280 CPU (1.66 Ghz clock rate / 2W TDP), 1 GB system memory, 160 GB hard disk, and 10.2" display, Asus submits to all defaults and does therefore barely stick out from the mass of mini notebooks. 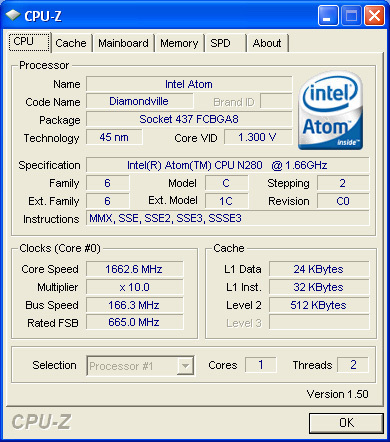 The now featured Intel Atom N280 CPU is the successor of the N270 processors and presents some minor improvements. 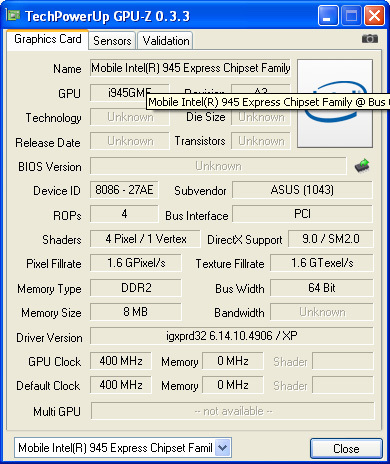 Besides a reduction of the Thermal Design Power (TDP) by 0.5 watts, the front side bus has been risen from 533 Mhz to 667 Mhz, as has the connected CPU clock rate - slightly from 1.6 Ghz to 1.66 Ghz. Leaps in performance cannot be expected through this, but an increase in efficiency in detail is indeed measurable, if not always noticeable. Besides that, Asus has turned the one or other setscrew with its own profiles, and overclocks the Atom CPU minimally to 1.69 Ghz in the "Super Performance Profile". This leads to 123 points in 3D Mark '06, 1475 points in PC Mark '05, and it calculates the 32M Super Pi Test in 4292 seconds. Therefore, the Asus is in the netbooks' top bracket and can score additionally through a reduced power input at the recording of the interval transit time. The Seagate hard disk works pretty fast, with an average of 54.7 MB/s, it only stood out in our test model through temporary, loud cracking. We could not note any detriment of performance resulting from it. When working in practice, everything went pretty gentle, as typical of netbooks, but without longer periods of waiting during the usage of several applications at the same time. Converting with iTunes simply takes longer, World of Warcraft can only be played at a resolution of 800x600 with minimal details at an average of 14 fps, and image processing is feasible only for absolutely basic tasks, because of the low screen resolution alone. The system is sufficiently fast and smooth enough for tasks in accordance with the status, such as browser, text processing, and communication via email and skype. 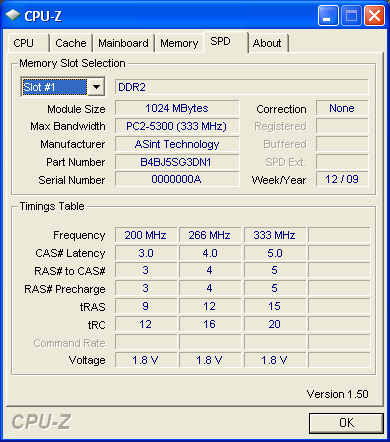 Compared directly to other netbooks, such as the Lenovo Ideapad S10e, or the Samsung NC10, the Asus 1000HE is audibly louder, but is altogether still on a silent level and reaches 32-36 dB(A) without load. One only notices the definitely audible vent with 40.4 dB(A) at maximal load. When it comes to noise behavior, the extremely quiet characteristics of the vent are pleasant for most users. It does neither produce high frequency noises, nor does it change the speed of rotation often, but does its work very constantly. 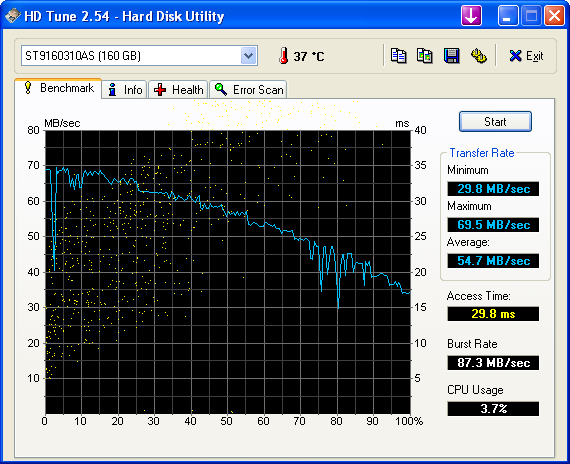 Only the Seagate hard disk presented itself unusual in our test model in a "cold" state with a cracking which was 37 db(A) loud. This fainted after some operating time and reduced to a working noise of low profile 33.7 dB(A). The vents can also be influenced with the already mentioned eeectl tool, the sound level can be reduced somewhat with it. One should be aware of the risk, as with the display's brightness, and accept possible damages under a loss of warranty. 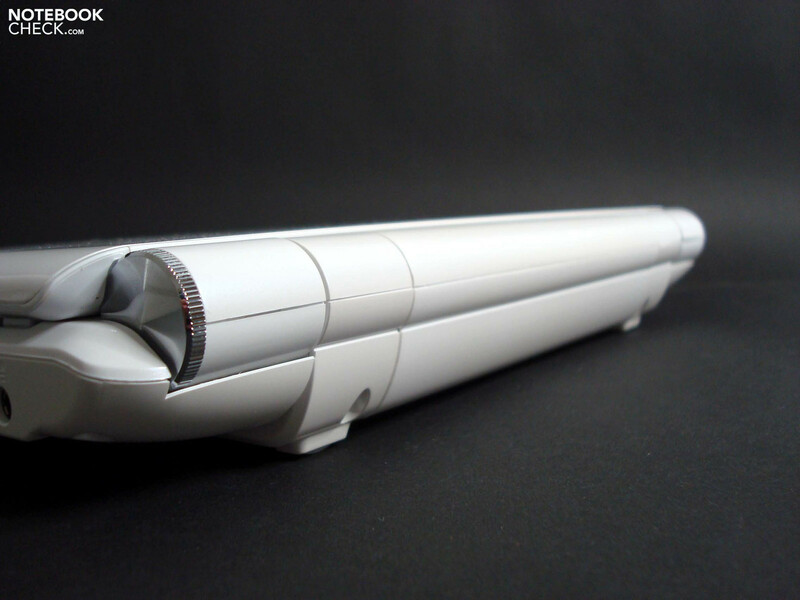 With eeectl, we could reduce the sound level to 31.7 dB(A) without load, at a vent activity of 30%. On average, the temperatures measured are in the range of human body temperature and are not indicative of conspicuities or possible limitations. Even the top value of 40.3 °C, which can occur in the middle area of the underbody, is absolutely within reason and does not let surmise any limitations. 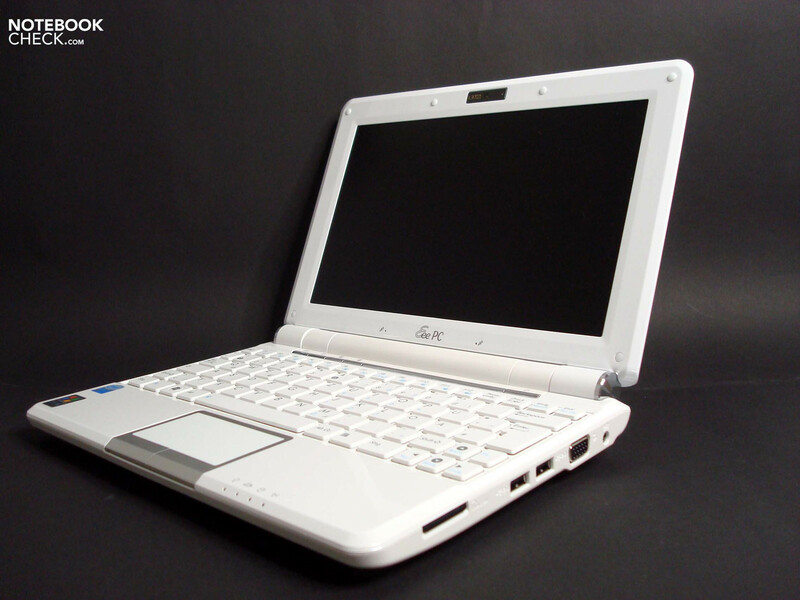 (±) The average temperature for the upper side under maximal load is 35.5 °C / 96 F, compared to the average of 29.8 °C / 86 F for the devices in the class Netbook. (+) The maximum temperature on the upper side is 38.1 °C / 101 F, compared to the average of 33 °C / 91 F, ranging from 21.6 to 53.2 °C for the class Netbook. (-) The average temperature of the palmrest area of similar devices was 29.3 °C / 84.7 F (-5.6 °C / -10.1 F). The loudspeakers are located on the front area and radiate forwards. They are quite sufficient for listening to music without great expectations, and convince through an undistorted sound. However, they very much lack bass and have few medium notes, and are also treble-heavy (as typical of this class). Furthermore, they also suffer from a low maximum volume. As usual, one can produce relief quickly and cheaply through earphones or USB-loudspeakers to get more for the mobile usage as well. 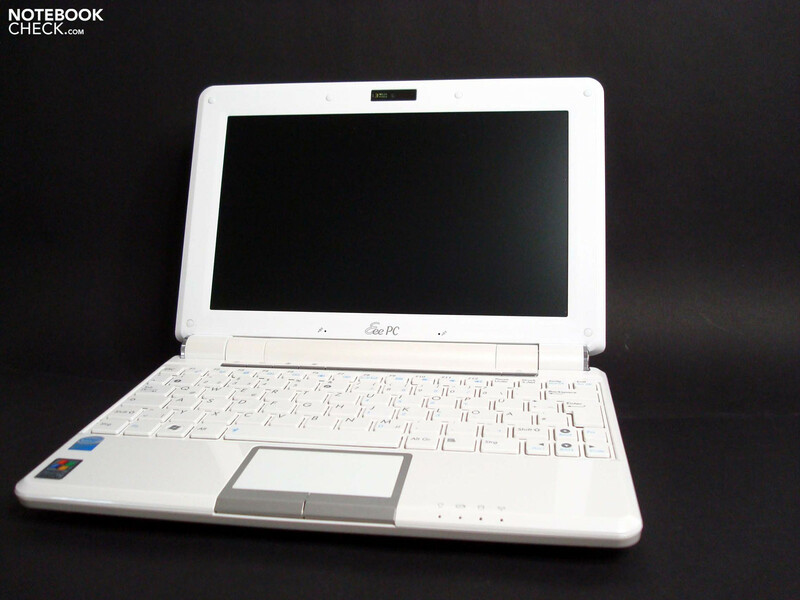 This is the Eee PC 1000HE's key skill. One readily accepts the device's somewhat higher weight of 1.46kg, due to the maximum battery life of - believe it or not - 512 minutes in the BatteryEater Reader's Test (maximal possible battery life). 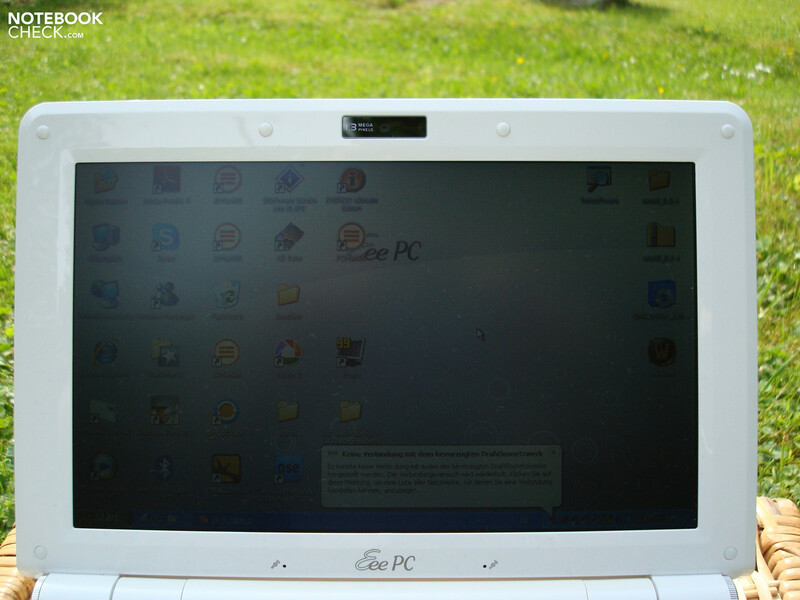 The mini notebook also features the necessary basic characteristics with a capacity of 62 Wh and a minimal consumption of 8.5 W.
The Asus energy saver profile "Power Saving" plays a great role in the low minimal power consumption, it intervenes far deeper in the energy-management than one is used to from Windows XP's profiles. The most obvious action is the Atom CPU, stepped down to a clock rate of 750 Mhz, which nevertheless makes surprisingly fast browser activity and document processing possible. The display brightness, stepped down to the minimum (which we as usually used in this test as well), is rather less suited for working. In the WLAN-test, with browser activity and pleasing display brightness, the Eee PC still reaches surprising 433 minutes. This is more like the user's behavior in practice and is also an excellent value. Those who think the performance of the processor, stepped down to 750 Mhz, is too low, can still expect 386 minutes in the WLAN-test. 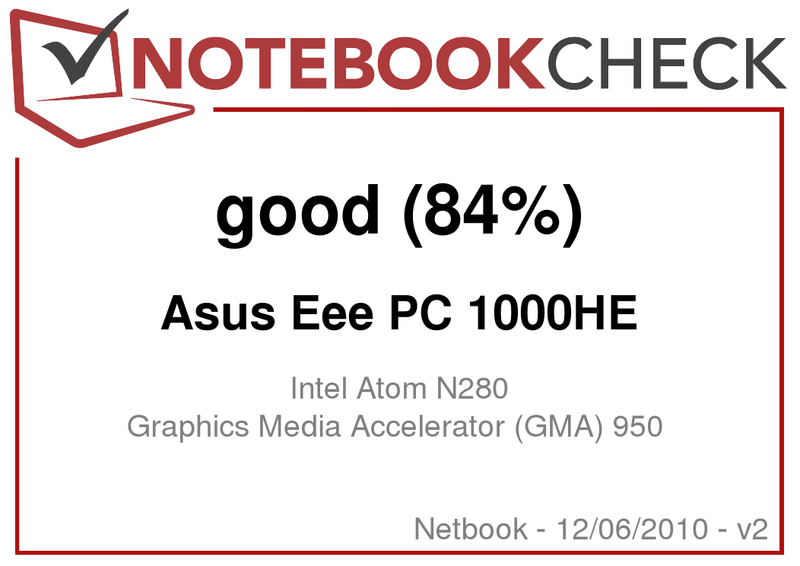 Under maximal work load, which means a clock rate of 1.69 Ghz for the Eee PC 1000HE in the Asus "Super Performance" profile, the netbook still reaches tolerable 272 minutes battery life in the BatteryEater Classic Test. It measures minimally reachable battery life under load, with switched on Bluetooth, W-LAN and maximum brightness of the display (Asus). 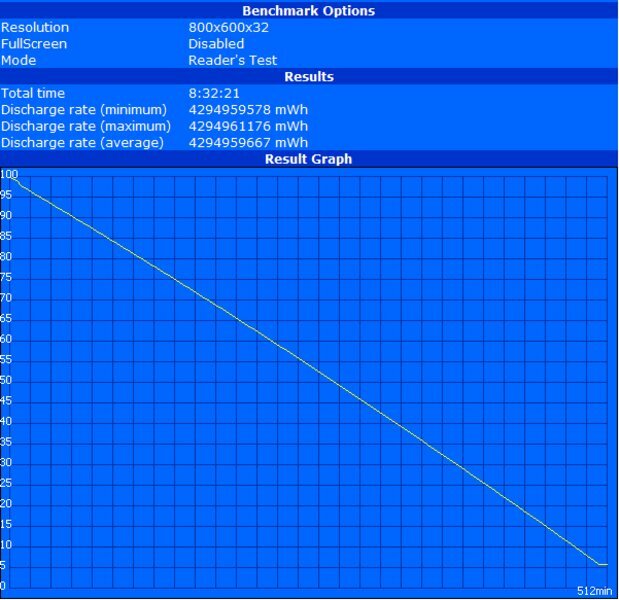 All in all, the Asus cannot reach the 9.5 hours of independence from the mains in our test, as promised by Asus, but it is on a very high level with a battery life between 4.5 and 8.5 hours, and very good characteristics for the quality of running for a long time in practice. 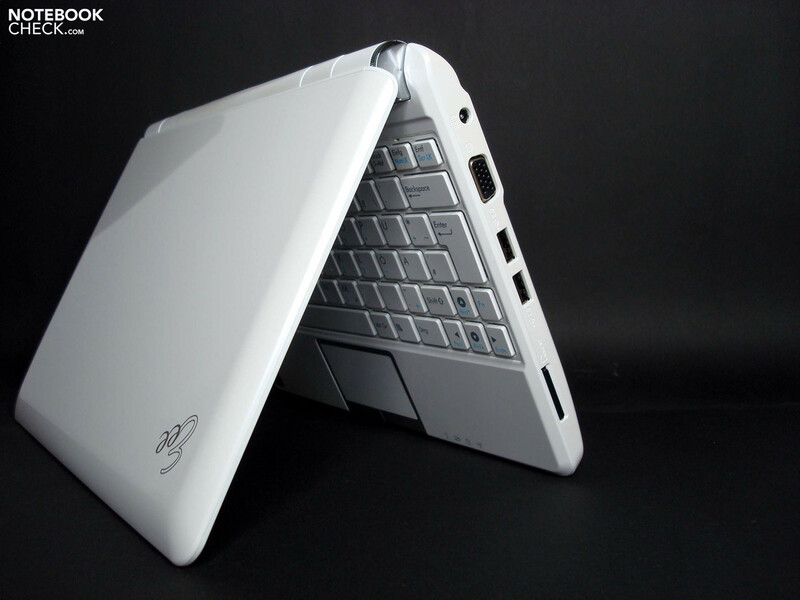 Whoever is looking for an especially enduring netbook should definitely shortlist the Asus Eee PC 1000HE. Even if the design might not be everybody's taste: battery life and build quality can be very convincing. Moreover, the matt display with strong contrast has very good characteristics for indoors and only loses points through its too meager maximum brightness during outdoor usage. As the flipside of the quality of running for a long time, one has to accept the lower-than-usual performance when making full use of it, and the somewhat higher weight. The uptight touch pad was bothersome on the test model, and the noise development does not quite reach the standard of many competitors. 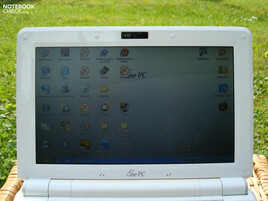 Those who can put up with these limitations find a solid piece of mobile technique in this variant of the Eee PC. We would have liked the audio jacks placed on the front side for headset and Co.
Ethernet and USB ports are nicely placed to the rear side. The extremely long battery life and the Asus energy saver profiles. The included neoprene sleeve is also nice and useful. A high ex factory display brightness, which makes outdoor usage possible without potential loss of warranty. That Asus used a matt display with excellent contrast values and even leaves behind the glossy competitors. 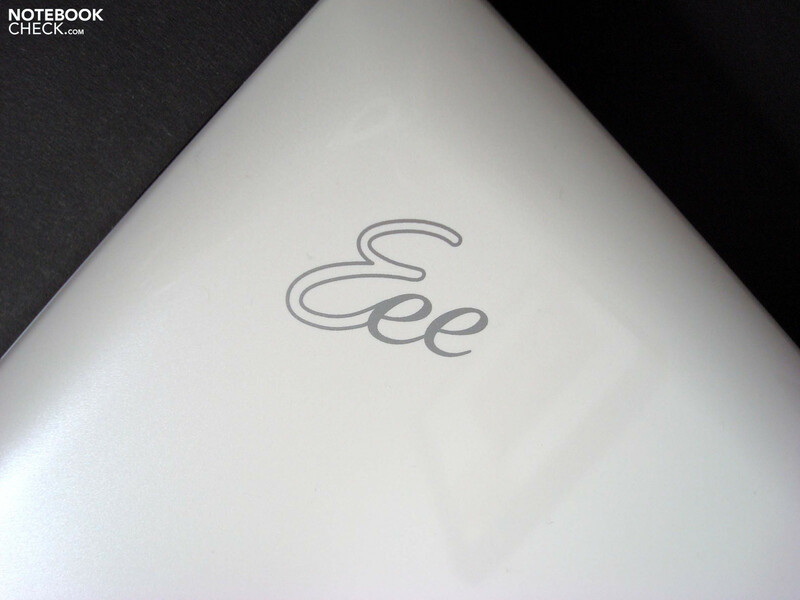 As far as the battery life is concerned, the Asus Eee PC 1000HE is unrivaled at the moment. 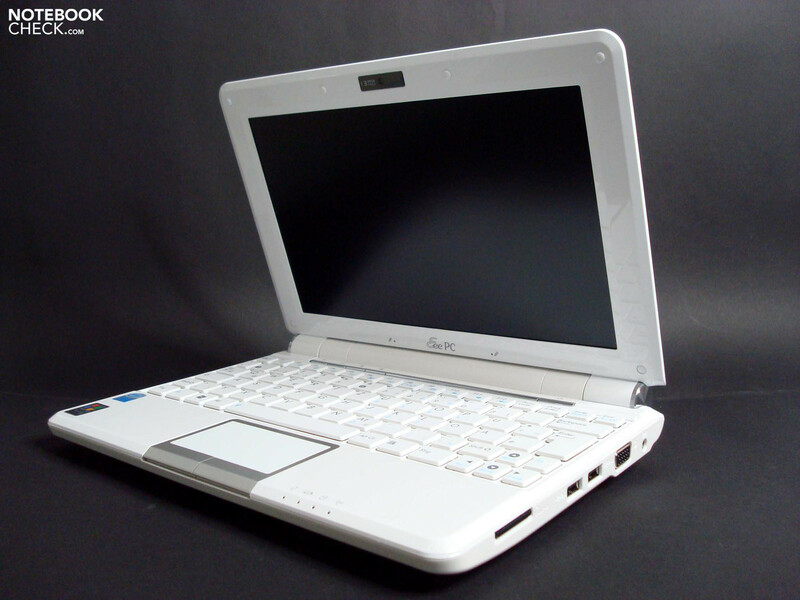 Possible alternatives with not quite as long battery life are the Samsung NC10 or the Acer Aspire One 531, these are also somewhat lighter, but not as powerful.